As an avid reader of album credits, I came across the name of trumpeter Duane Eubanks (brother of guitarist Kevin and trombonist Robin) on one of the final albums for the great Phyllis Hyman, “Forever With You” from 1998, where he was featured on the title track and on “The Strength Of A Woman”. A year later, he recorded his first album as a leader. And his new one is only his third. It’s because he has been an in-demand player on so many projects, not only by his brothers Robin and Kevin, but also by artists like Alicia Keys, the Dave Holland Bigband, Wu Tang Clan, or Mark de Clive-Lowe. His new album features his original compositions except for one tune written by the late great Mulgrew Miller (Duane played on the pianist’s “The Sequel” album from 2002). Executive-produced by his wife Aleta and co-produced by his drummer Eric McPherson, the album starts out unagitated with a trumpet intro before the “Purple, Blue, And Red” unfolds as a shining bop vehicle showcasing not only Duane’s faultless, impeccable sound, but also introduces the band: tenor saxophonist Abraham Burton has a wonderful shriek-less solo before pianist Marc Cary takes over with his striking touch after which the band jumps back in with the melody. And the album continues on this high level with “As Is” and the brilliant “Rosey”, starting with bassist Dezron Douglas before Cary steps in with a sparkling Fender Rhodes turning the piece into a mellow, funky tune which is far too short. And with the Mulgrew Miller composition “Holding Hands”, we get to hear the final member of this A-list band: vibraphonist Steve Nelson who also played with Eubanks on the aforementioned “The Sequel” album. 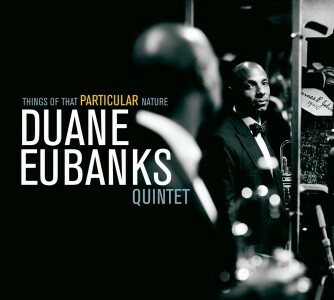 Duane reminds me here a bit of the latter-day Donald Byrd from his Landmark albums. It is a cool, relaxing piece as is most of this totally enjoyable album. My favorite piece, and just in time for the beginning of spring, is a joyous, blossoming “Beer & Water” (I love the title) which makes a lot of fun. Tempo is going down again for “Anywhere’s Paradise” where Marc Cary is sharing some meandering lines along the two horns. Great stuff. And the beautiful melody of “Dance With Aleta” is another fine example of the harmonious writing of the leader and the sterling, meticulous, but never tedious playing of both Eubanks and Burton. “Slew Footed” could have been recorded in a live setting; with each soloist, the tempo and mood changes and drummer Eric McPherson is jumping. Very highly recommended, this album makes a lot of fun.